These days, Rosie the dog runs and plays with her new best friend and fellow canine Coby, in her new home and without a care in the world. To see her in action, one might never know that only a few months ago, she was in a fight for her life, her tomorrow hardly promised. On a September day in Luling last year, Rosie was found in a pile of trash along the side of a pit road by animal control officer Micah St. Amant. The 1-year-old bully breed was seemingly left for dead, malnourished and in desperate need of care. St. Amant took her to the St. Charles Parish Animal Shelter for medical attention, and Rosie’s case was so severe that euthanasia wasn’t initially ruled out: she was diagnosed with severe anemia, hookworms, whipworms, heartworms and extreme malnutrition. But she showed fight, and so the shelter staff fought for her. And because of that, Rosie is not only well, but counts herself as a lucky dog adopted into a new, loving home by new owner Londa Elliott of Metairie. Elliott had gone to the shelter with her dog, the aforementioned Coby, in order to find a “buddy” for the latter. She initially had interest in another dog, but had to find out if the dog got along with Coby first. The two dogs were peas in a pod. However, Elliott also has two cats, and when shelter staff had the dog share a room with cats, it didn’t go so well. Rosie was just fine with the cats, “oblivious” to them as Elliott put it, and also got along fantastic with Coby, who incidentally was adopted as another rescue case. Sometimes, Rosie does chase Elliott’s cats, but “believe me, those cats will put her in her place,” Elliott added with a laugh. 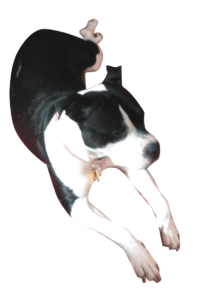 She also said Rosie is loving and playful, and conversely loves to be loved. It took some doing to get Rosie to this point, of course. When St. Amant first brought the dog to the shelter, she was virtually skin and bones, and very weak. She required an immediate blood transfusion, IV fluids, deworming, constant therapy and eventually heartworm treatment. The dog’s head was too heavy for it to hold up for even a few seconds in the beginning. Dr. Jena Troxler, the shelter’s supervisor, called it the most severe starvation case she’s seen in her decade of shelter medicine practice. Troxler said she and the shelter got a big assist from Dr. G of VetNaturally, who made available her eastern medicine treatments and guidance including essential oils, heat therapy with moxa sticks, acupuncture and massage therapy, as well as the parish community who offered monetary donations—and some even cooked homemade diet recipes for Rosie. Rosie went from 17 to 37 pounds and earned back her strength. Troxler said it’s especially rewarding to see it, knowing Rosie’s recovery was hardly a given. She called the first three weeks of Rosie’s treatment critical, and acknowledged that when a patient is as debilitated as Rosie was, sometimes there simply is no reversing the damage. Rosie’s far from the only abandoned or abused pet to fall under shelter care, and many animals aren’t so lucky to be found in time for saving. Rosie was found last September in Luling. 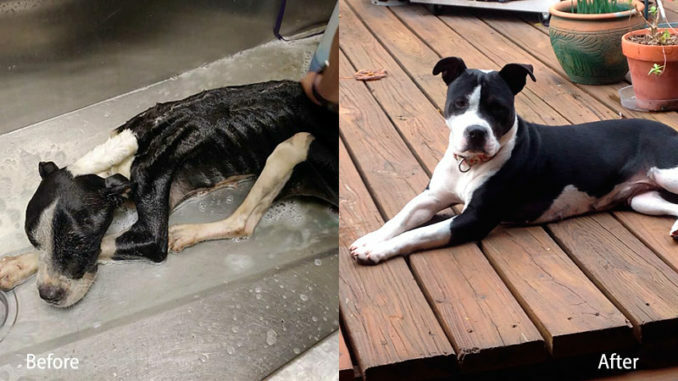 She was starving and near death. She was diagnosed with severe anemia, hookworms, whipworms, heartworms and extreme malnutrition. After a long rehabilitation process at the St. Charles Parish Animal Shelter, she was recently adopted into a new home. If one comes across an abused or abandoned animal who is suffering, contacting police or animal control could ultimately save its life.